CARL BAMBERGER AG, Möbelfabrik, Wien: Englische-Stile. [Album with 47 tipped-in vintage photographies and 1 tipped-in colour pencil drawing of arm chairs, bureaus, chests, tables, sofas and stools]. S.l. [Vienna], s.a. .
34:25:5,5 cm (album), 7:10 to 24:19 cm (photos). 41 dark brown cardboard leafs, where of 40 with 47 tipped-in photos and 1 drawing in different portrait or landscape format, numbered as follows: p. 1-80, [2 p.]. Original dark-brown half cloth with black title on front cover painted by hand with stencil, cardboards bound in separately with strong linen folds and partly with transparent protection leafs. 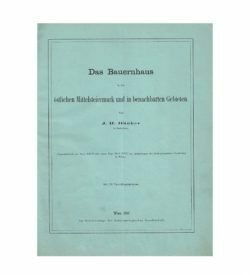 Unique archival document and probably also presentation album for customers of renown Vienna furniture industry Carl Bamberger AG, a company that also executed for Wiener Werkstätte and was „Arianised“ when the Nazis annexed Austria in 1938. 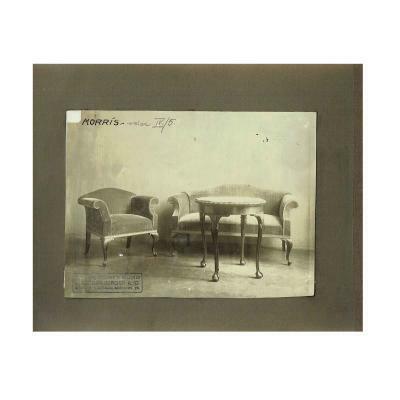 The 47 included photographies of this album (accompanied by one additional colour pencil drawing), tipped in on hand-numbered cardboards and titled „English style“, show arm chairs, bureaus, chests, tables, sofas and stools, mainly in suites. The front leaf recto bears a tipped-in hand-written table of contents mentioning 6 production series titled „Butterfly“, „Franklin“, „Hamilton“, „Stephenson“, „Tennison“ and „Wellington“. 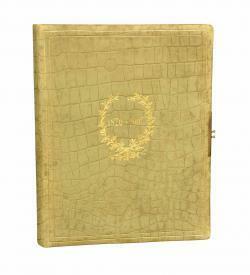 Additionally „Beardsley“ and „Morris“ and to be found inside, hand-written on 2 of the photos. Most of the furniture is designed in neoclassicist styles of the 18th and 19th century, however some of them also incorporate Art Nouveau and other modern elements. Many of the objects were photographed with small panels aside, stating measures. Others are marked by hand with different combinations of numbers and letters, numbered with a stamp or stamped with the company’s seal („Technisches Büro / Carl Bamberger A. G. / Wien., V. Schönbrunnerstr. 25.“). Paul Bamberger, son of founder Carl, had to flee the Nazis in 1938 due to his Jewish origins and continued the business in New York. The company’s Viennese head office in Schönbrunnerstraße 25 was taken over by neighbouring cabinetmaker Mathias Brunngraber (Rüdigergasse 8), whose successor ran the business until 1982. 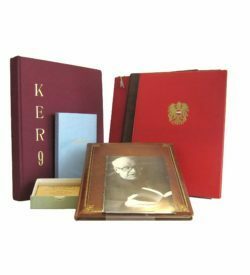 Cover worn and torn due to heavy use, cardboards in parts with traces of glue, protection papers partly creased, some of the photos slightly stained, altogether well preserved album, a unique collection of Viennese conservative cabinetmaking around 1900. Aufbau (New York), 21st April 1944, p. 23 (advertisement of Bamberger, New York); Adolph Lehmann’s allgemeiner Wohnungs-Anzeiger 1938, vol. 2, p. 263 and 1939, vol. 2, p. 212f. MAKART, Hans [d. J. ]: [Fotoalbum mit 10 Portraifotografien anlässlich des Dienstjubiläums des Nordbahn-Beamten Christian Uzel.] Wien: Photogr. Kunstanstalt Hans Makart 1905. SHENYANG (沈阳, 奉天 [HŌTEN], MUKDEN). 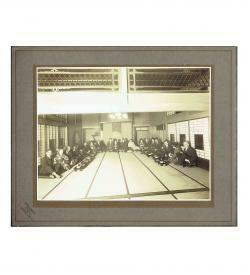 8 vintage silver-print portraitures and group pictures. Mukden: [1928-1932].